This week’s ISIS-inspired truck attack in lower Manhattan by Uzbek immigrant Sayfullo Saipov has prompted discussions on a number of fronts. There is blowback, the foreign-policy-chickens-come-home-to-roost indicated by an increasing number of radical Islamists emerging from the former Soviet republic of Uzbekistan, a Central Asian nation whose brutal dictatorship is financed and armed by our U.S. taxdollars. There is the ongoing verbal diarrhea of our mentally diseased president, whose tweets that Saipov deserves the “DEATH PENALTY” (caps his) were overshadowed by his even more outlandish suggestion that the suspect be reclassified as an “enemy combatant” (a Bush-era phrase undefined by American law) and sent to the U.S. torture-concentration camp at Guantánamo. Always the opportunist, Trump also said the “diversity visa” program ought to be abolished because Saipov came to the U.S. under what is more commonly known as the visa lottery. Though in recent years there has been considerable progress in terms of setting aside asphalt for bike paths, walkways and urban parklets in New York and many American other cities, city officials seem largely oblivious to the risks of placing soft human bodies in close proximity to speeding cars, SUVs and trucks. I almost understand the city’s reluctance to dedicate a bike lane to, or to dedicate entire streets to, along smaller crosstown thoroughfares. They’re too narrow; you’d have to eliminate a lot of street parking, which would create more congestion. But the way New York has handled bike lanes along big boulevards is nothing short of inexplicable. The West Street path where Saipov murdered his victims benefits from a short jersey barrier along the automobile section. But it’s easily accessible to even a large truck driven by a person of ill will, as we saw a few days ago — not to mention the random drunk who thinks it’s a service road. And it contains yet another ridiculous design flaw: putting pedestrians and bicyclists in the same space. 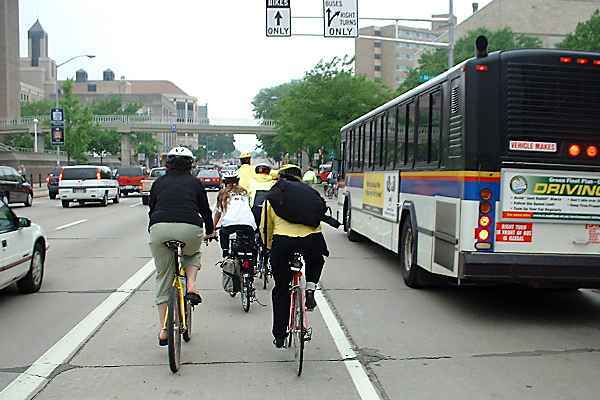 Cyclists weave between walkers, terrifying them. Walkers are oblivious to cyclists, creating more accidents. Each deserve safe, discrete spaces to enjoy the outdoors. This entry was posted in Blog, Columns and tagged bicyclists, bike paths, bikes, Islamism, NYC truck attack, pedestrians, Saidov, Terrorism, urban planning, West Side Highway on November 3, 2017 by Ted Rall. Free Syrian Army rebels, supported with money and arms by the United States, are establishing Taliban-style sharia law in the areas they control. Here we go again, replacing secular socialist governments with Islamist fanatics poised to become our future enemies. This entry was posted in and tagged afghanistan, Arms, blowback, CIA, Foreign Policy, fornicator, Free Syrian Army, Islamic fundamentalism, Islamism, lashes, Sharia, Syria, Taliban on July 30, 2012 by Ted Rall.